Pertex fabrics, “super-DWR,” and featherweight construction: Eddie Bauer’s First Ascent climbing releases for spring 2019 clearly show the brand wants to compete with the best of the best. “Should baselayers have thumb loops? Should gloves have clips so you don’t lose them? Should gloves have tight cuffs or gauntlets?” IFMGA-certified guide Kent McBride puzzles these questions regularly. 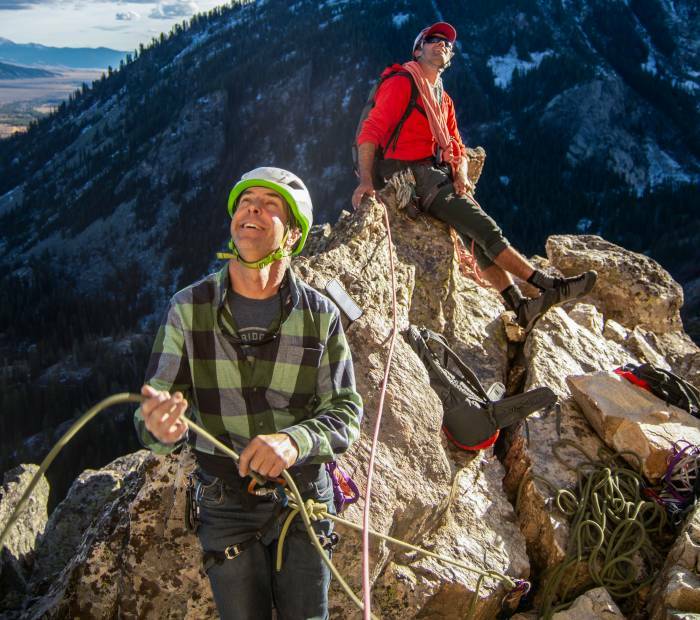 McBride and the rest of Eddie Bauer’s professional guide team debate these topics for hours — and it shows. On an exclusive trip to the Tetons last fall, Eddie Bauer showed GearJunkie its spring 2019 line. The two main releases for the season were climbing shells. Between the BC Uplift and the BC Sandstone Stretch, Eddie Bauer is clearly marketing for a high-end athlete user group and outdoor-professional clientele. We tested the Sandstone and Uplift for an abbreviated 3 days, but the Tetons gave us plenty of testing weather. And the shells proved dialed pieces for climbers: minimal, lightweight, and well-built. But beyond the testing, we got an inside look at how Eddie Bauer views gear and how it produces such high-quality pieces for a low price point. Instead of releasing new items for spring 2019, Eddie Bauer updates two existing First Ascent pieces. The Sandstone is a windproof climbing shell with stretchy, durable fabric. 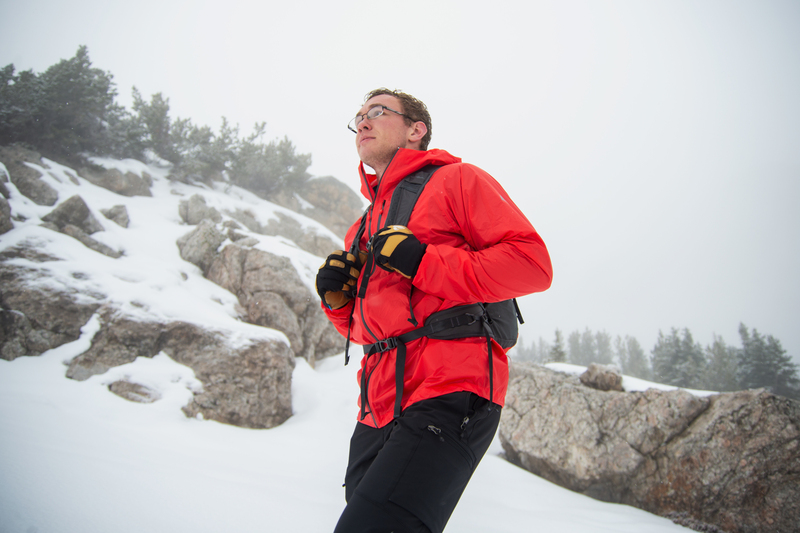 And the Uplift is a 20K/20K waterproof-breathable alpine climbing shell. Over the past few years, Eddie Bauer has steadily released products under the First Ascent umbrella that impress us time and again. The two shell updates add to Eddie Bauer’s impressive mountain-sports line. At 6.3 ounces, the BC Uplift is Eddie Bauer’s lightest waterproof shell intended for moving fast and light. It uses a 2.5-layer Pertex Shield shell with Eddie Bauer’s “super-DWR” treatment. This means the DWR will last after numerous at-home launderings and water will still bead off, according to the brand. The Uplift packs into its own pocket, so you can throw it into a pack without feeling extra weight and pull it out when a surprise storm rolls through. 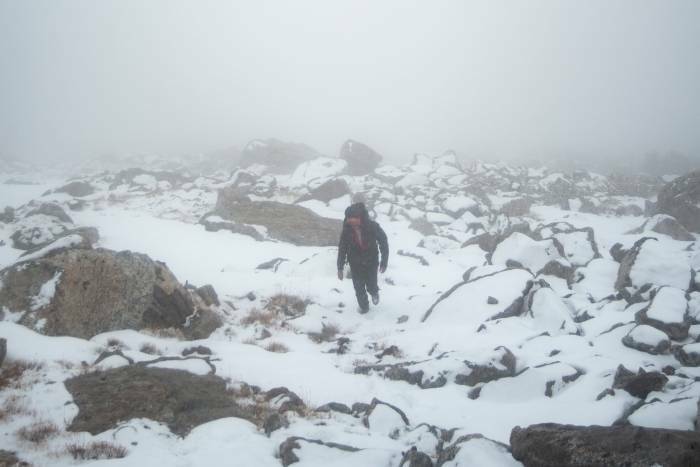 Meanwhile, the Sandstone Stretch is a burlier, breathable, three-layer waterproof/windproof shell for alpine environs. It’s soft to the touch, quiet, and lets you grab holds without any restriction. 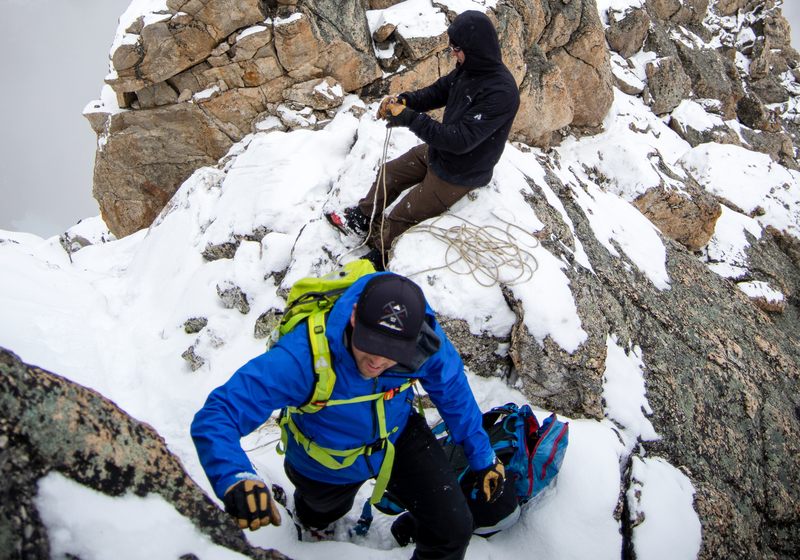 The North Face sends athletes to Antarctica to put up first ascents. Patagonia’s ambassadors win 100-mile races and espouse their environmental views. But Eddie Bauer isn’t necessarily known for its athletes. Instead, the brand prides itself on being a “guide built” brand. Spending time with McBride in the Tetons, I could see the appeal of trusting guides with gear feedback. By guiding clients, they gain insight into how consumers use gear. Between both 2019 shells, guides Kent McBride, Melissa Arnot, Caroline George, Katie Lambert, and Adrian Ballinger tested the gear. In the Tetons, we pitted the shells against a gamut of piss weather. 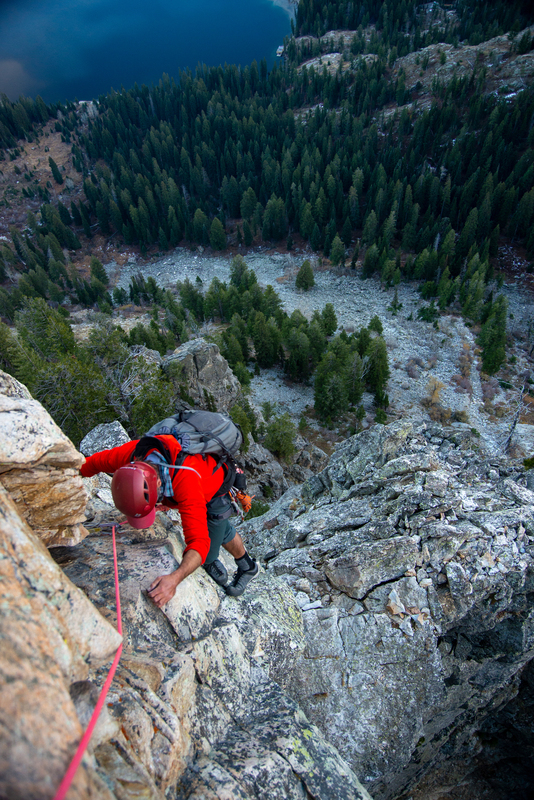 We received 5 inches of snow and seven pitches of mostly dry rock in 3 days. The BC Uplift feels durable for being such a lightweight shell. Too often, I feel nervous wearing ultralight gear for fear of tearing it. In the short term, this piece held up. The exterior has a waxy finish, and there weren’t any superfluous features or clips to distract me. It certainly kept me dry, and I barely noticed it in my pack. Stuffed into its own interior pocket, the Uplift takes up about as much space as a tennis ball. Once it really started dumping on the way to Disappointment Peak, I put the BC Uplift on and climbed without distraction to the top. For its part, the Sandstone proved great for keeping me warm during a windy two-pitch route after it stopped raining/misting. The bottom of the route had sections of wide off-width crack, a perfect test for durability. I shoved my hands and arms into the rock as I struggled up the route. Afterward, the Sandstone didn’t show any signs of wear, aside from some stains from the rock. The Sandstone weighs 11.6 ounces and costs $279. After our initial test, the shells impressed me. But between the two, the BC Uplift was the clear standout. With a 20K/20K waterproof-breathable rating and weight under 7 ounces, I’d expect it to cost much more than its $199 retail price. If this isn’t testing weather, I don’t know what is. In 2017, Eddie Bauer released the Evertherm Jacket, a GearJunkie Gear of the Year pick for that year. And last summer, it made updates to its bombproof Katabatic four-season expedition tent. The BC Uplift and BC Sandstone add to Eddie Bauer’s impressive list of gear releases under the First Ascent line. And both hit shelves this spring. Thanks to its trusty formula of guide testing, I imagine Eddie Bauer will continue to impress with each gear release.